A year ago this weekend, Martin O'Neill's Ireland knocked three goals past Uruguay in a friendly match at the Aviva Stadium. The result mattered little against a side that appeared to be in holiday mode but Ireland's display was encouraging. Jon Walters scored a fine goal from distance, with Cyrus Christie then getting into the position to score a fortuitous second. 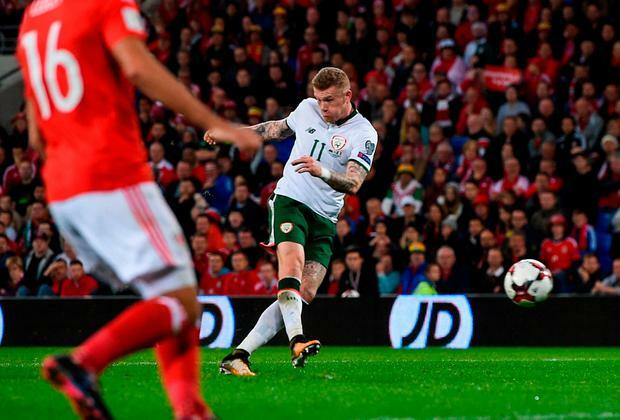 James McClean broke clear to finish the game off clinically. It's a strange encounter to feel nostalgic about, because the suspicion lingers that Ireland fans who can remember the details without referring to Google are in the minority. 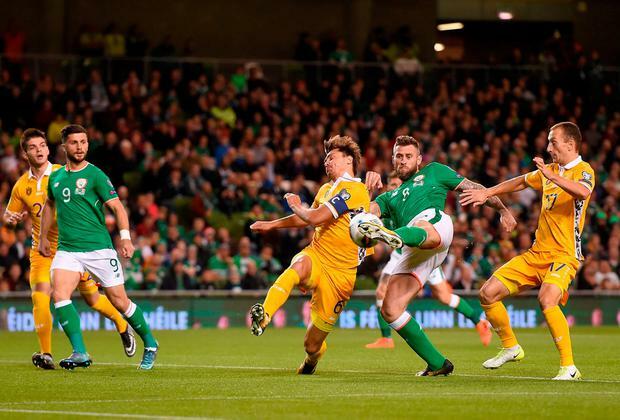 That match was followed a week later by a 1-1 draw with Austria where a late hit-and-hope punt from Robbie Brady led to a brilliant volley from Walters. O'Neill's side could even have nicked it at the death only for a clumsy Shane Duffy attempt which was disallowed. As it turned out, that was a window to the future. That's because Ireland are now at the stage where Duffy roaming around the area for a set piece is arguably their greatest goalscoring threat. The stats make for grim reading. Since that Uruguay match, Ireland have scored six goals in nine games. That Walters effort is one. 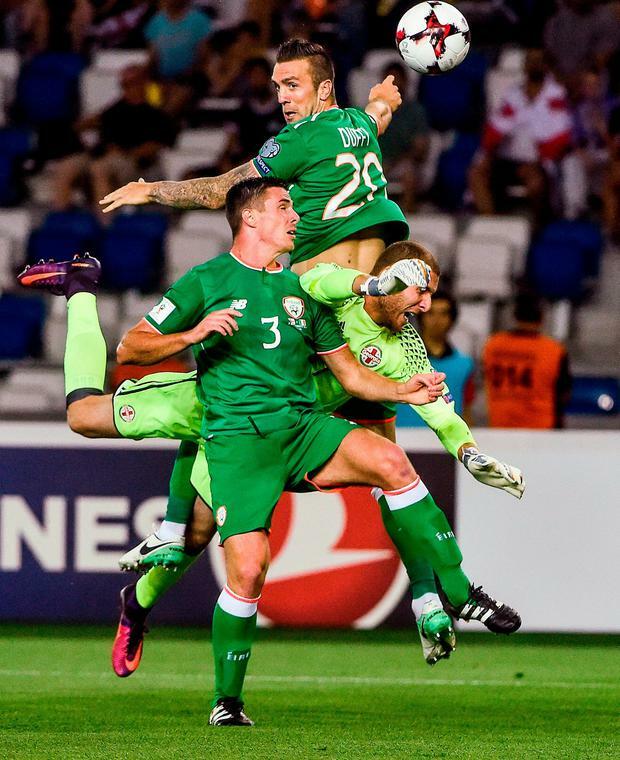 Daryl Murphy, who has since retired from Irish duty, scored twice against Moldova from aerial deliveries. 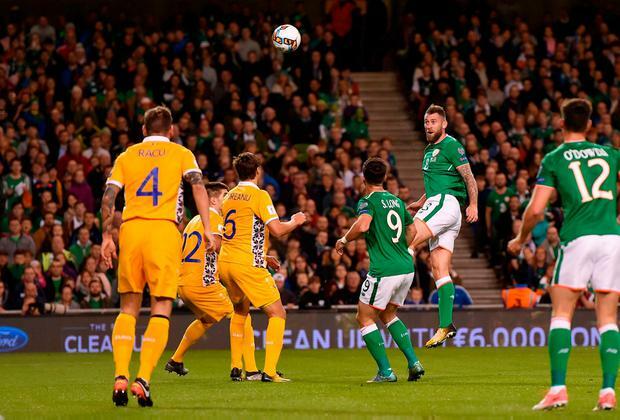 An early Duffy header gave Ireland false hope in Georgia and the Brighton defender did the same at the Aviva on that grim night which ended with a Danish pasting. The only goal that was not in danger of being affected by the wind speed was McClean's fantastic effort in Cardiff that was created by the perseverance of Jeff Hendrick and a clever dummy from Harry Arter. Otherwise, Ireland have relied on the set piece route to goal with Duffy at the centre of it. In this year's games with Turkey and France, one shot on target has been registered - Shaun Williams late effort on Monday. O'Neill has voiced his concerns about forward options. Good teams find a way to compensate for their inadequacies, though. Shane Long's last Irish goal was 19 months ago while injuries have blunted Walters' impact since Austria. But what is really troubling is that an Irish side that often plays with one up front cannot produce the patterns of play that allow runners from midfield to get into the area and help out the front men. Hendrick has toiled when selected as number 10. Robbie Brady was below par in the campaign just gone. Conor Hourihane has scored goals at club level, but has not been able to bring that form to the international scene just yet. Alan Browne plays in an advanced role for Preston, yet he has found himself going the other direction in Turkey and France. "It's been difficult to try and get goals," said O'Neill late on Monday night. "And to try and create enough chances to take one or two. "I don't think we can ever stop trying to improve on that, trying to make chances and create things. Either in one-on-one situations or a little one-two and just not to be depending on set pieces maybe." Ireland did knock four past the USA the last time they visited in November 2014, and it could be dangerous to read too much into anything that happens on Saturday as a guide for the sterner tests in the autumn. However, the Irish public will want to see some evidence of real attacking innovation and ideas if they are stay on board with this ticket. O'Neill did experiment in March by switching to 3-5-2 and going with two attackers in the form of Sean Maguire and Scott Hogan, yet it didn't actually help Ireland because they were unable to get the ball to them. The failings in possession almost rendered the system irrelevant. McClean embraced the role of talisman in the last campaign, although the downside of that is his tendency to go roving and try and force things when the team is labouring. As a right winger, Walters is not going to get on the ball in his own half and drive the team forward. McClean can't do that when he is drifting out of his position. In Seamus Coleman, Ireland have one of the best attacking full-backs in the business. But he is unable to showcase that in this side. This is where management have to come up with a solution. O'Neill is not going to change his football philosophy, so there will always be an emphasis on strength and physicality. Ireland can hurt teams that way, and there's nothing wrong with Duffy being a focal point from set plays, but it cannot be the only effective method of attack. There comes a point where he has to try out some players with creative instincts, even if they may not be at the level of their predecessors. Alan Judge is still trying to return to the level he was at before the horror injury that ruled him out of Euro 2016, but he can still take up good positions. Daryl Horgan has endured a poor season at Preston, yet he was sprightly in the final minutes in Turkey. Club commitments on Friday night are likely to curtail Graham Burke's involvement on Saturday. However, the Shamrock Rovers player is technically excellent. These players may lack the all-round qualities of the players ahead of them in the queue, but Ireland need to try and find a spark from somewhere. When Brady returns to full health, he will play. Hendrick has to do more and it would be informative if he managed to shake off an injury before Saturday because a pairing with Declan Rice would be interesting. We know what Arter and David Meyler can do. The goal drought is the major worry heading into the most important qualification cycle in recent memory. Missing out on Euro 2020 with Dublin as co-host would be a disaster. But opposing teams know that if they are disciplined in defending set pieces, they can neutralise the Irish threat. O'Neill has never placed too much stock on friendly results, either good or bad, and Ireland should be a sturdier proposition in meaningful games. But a team that cannot find a way to score a goal from general play does not deserve to be at a major tournament.